USD is getting weak as the result of the election issues. The support rests at 102.380 with resistance at 103.240 which both lines are below the weekly pivot point at 104.640. 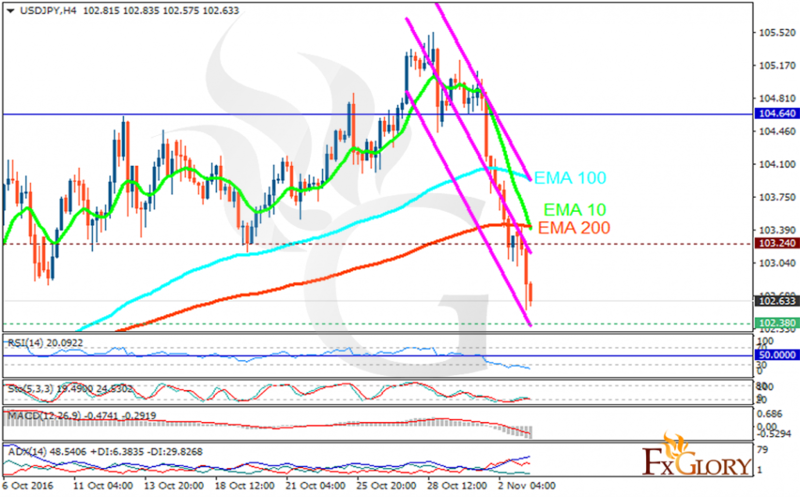 The EMA of 10 is moving with bearish bias and it has crossed the EMA of 100 and it is now close to the EMA of 200. The RSI is moving in oversold area, the Stochastic is moving horizontally in its minimum rate and the MACD indicator is in negative territory. The ADX is showing stronger sell opportunity than buy. The pair is not going to fall lower than 102.50 therefore we will observe short term decline and after that correction pattern towards the 103 area.